Atmospheric carbon dioxide levels grew at a record pace in 2016, to 403.3 parts per million (ppm), up from 400.0 in 2015, the UN World Meteorological Organization just revealed as part of its annual Greenhouse Gas Bulletin. The growth rate in atmospheric carbon dioxide in 2016 was thus around 50% faster than the average of the last decade — showing just how rapidly greenhouse gas concentrations in the atmosphere continue to rise despite the supposed “decoupling” of industrial activity from emissions put forward by some. 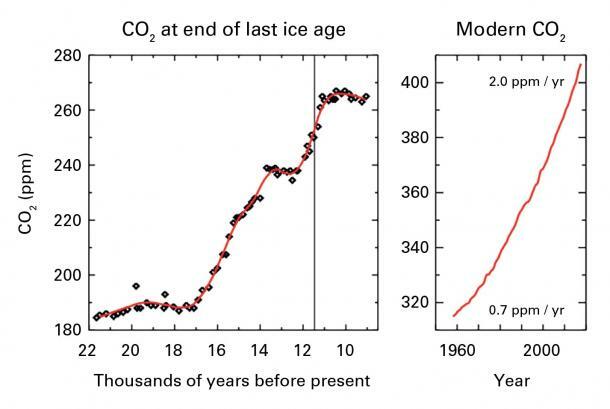 What the news also means is that atmospheric carbon dioxide levels are now roughly 45% higher than they were during the pre-industrial period, and even further beyond the range of 180-280 ppm seen during the recent ice age oscillations of the last few tens of thousands of years. Also noteworthy is that with the atmospheric carbon dioxide levels where they are now, a temperature rise of up to 3° Celsius is now baked in, as is a sea level rise of up to 20-meters — though, of course, the path to a higher point of equilibrium is always choppy. “Today’s CO2 concentration of ~400 ppm exceeds the natural variability seen over hundreds of thousands of years,” the WMO bulletin read. He also writes: “New data published this week by the World Meteorological Organization show that concentrations of carbon dioxide, or CO2, in the atmosphere surged to their highest level in 800,000 years. As the world seems to be in no hurry to actually limit greenhouse gas emissions to any substantial degree, rather than just talk about doing so, atmospheric concentrations are slated to continue rising, bringing with them catastrophic changes well beyond those that occurred during the mid-Pliocene era.